Expedite began in 1977 with a single truck making deliveries around Buffalo. It’s owner was Jack, and he proudly drove that truck and earned a reputation as an honest, hard-working, and reliable owner. As you may well know, trucking can be a tough business to grow and thrive in Buffalo, but Jack’s diligence and sometimes a flat out refusal to give up developed that single truck into a thriving business. Jack and the company maintained that reputation and grew year by year. Expedite now has a fleet of trucks that serve all of Western New York with a variety of transportation services. You can see our full list of offerings here. In the past, Jack was always in a truck, phone close at hand, making deliveries and building relationships. Now, he is most often found in his office or the warehouse, phone still at hand, but if you are lucky, he will jump back in a truck and make a delivery himself. In 2006, Jack took the company even farther by opening his own warehousing operation. Again, he started small by storing and fulfilling orders for one company. With that experience and more, Expedite now offers Western New York a well-established distribution location tied directly to a premier trucking service for a complete logistics package. The key to Expedite’s success and customer satisfaction has always been Jack’s commitment to integrity and putting his customers’ needs at the top of his priority list. 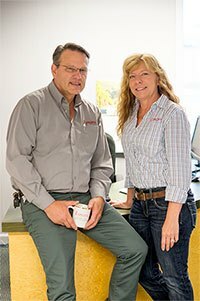 As the company has grown, he has maintained those principles by continuing to offer personal service, high caliber employees, and a variety of services. You see, at Expedite you won’t be forgotten amidst a large corporate mentality. You will work directly with people with years of experience who make your business their top priority. Here at Expedite Transportation, we consider ourselves as part of your team and want to greet you with a smile. We don’t settle for giving you less than our best. Join our monthly newsletter to keep informed on new blog posts, photos, and more.